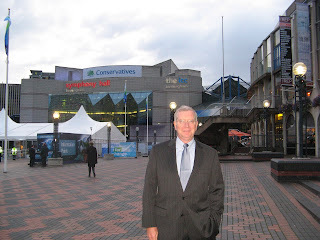 I’m blogging from inside the Annual British Conservative Conference. Conservatives here are very different from American conservatives. The best evidence is that there are booths for the British Humanist Society and the British Secular Society, both commited to advance the cause of non-religious people in England. Such booths at a Republican meeting in the U.S. would probably invite prayer vigils for the souls of the damned individuals working at them. In fairness, you wouldn’t see such booths at a Democratic meeting either. Here in Europe, the Enlightenment goes on, much to the frustration of Pope Benedict.